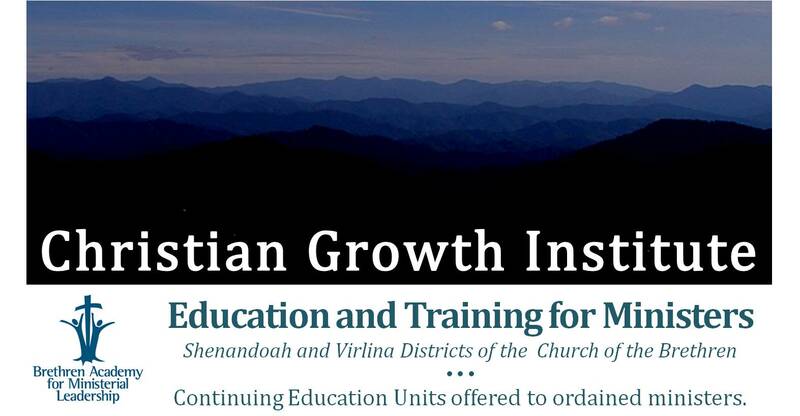 The Christian Growth Institute is an accredited education program designed with those in mind who have been called into the set-apart ministry but are not able to pursue a seminary or TRIM degree. Together with the Shenandoah District Church of the Brethren, Virlina works to equip ministers with the best training. Those who are passionate about the ministry, and who do not want to become a licensed or ordained minister, are encouraged to also enroll in the program or take classes that one finds interesting. For more information, contact the District Resource Center. Keep reading for program requirements and upcoming classes. Download the most recent brochure here! Orientation: This is a one day event to introduce the program to students. Portfolio: This is designed to help studetns with their minitry goals. Quarterly meetings with a mentor will aid in this. Practice of Ministry Days: Students are required to participate in 3 Practice of Ministry Days, which are held annually, and cover a wide range of topics spoken on by guest speakers. Ministry Formation: 3 spiritual formation retreats are required to help students develop and learnd about the spiritual disciplines. Supervised Ministry Experience: This is still in the works, but the goal of this will be to allow a student to benefit from an on-site ministry experience under the direction of an experienced pastor. Broader Church: Students ae required to attend at least one Church of the Brethren Annual Conference, one district conference, and a significatn ecumenical, interfaith or intercultural event. All instructors for classes have at least a M.Div. and/or a Master’s degree. Southern Center courses are taught at the Coulson COB located at 4127 Coulson Church Rd., Hillsville,VA. Classes will be held on Saturdays from 10:00 a.m. to 3:00 p.m. Sue Morris is the Center Coordinator. Roanoke Center courses are taught at the Virlina District Resource Center. Classes will be held on Sunday afternoons from 2:00 p.m. to 6:00 p.m. Judy Mills is the Center Coordinator. Shenandoah Center classes are held at the Shenandoah District Office at Weyers Cave, VA. Classes will be held on Saturdays from 9:00 a.m. to 3:00 p.m. Sarah Long is the Center Coordinator. The thirteen (13) classes and three (3) Spiritual Formation Retreats, one (1) orientation day, and three (3) Practice of Ministry Days are required to complete the program. Other required components of the program include a portfolio of ministry experiences and report on, attendance at one annual conference, one district conference and a significant ecumenical, interfaith or inter-cultural type event.